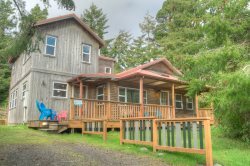 Hands down, Manzanita Beach Getaway Rentals is an excellent business. We have rented 2 homes through them in the past 6 months. I have not stopped recommending their services to friends and family. Looking forward to renting future homes with them in the years to come! The house was excellent, especially for a dog friendly house. Very clean with great amenities. Excellent house for kids and adults- lots of space. We hunkered down in this cozy house while the beach was frozen solid and freezing rain fell. Ample games on the shelf, and a fully functional kitchen turned our siege into a pleasure. Upstairs suite a plus, and an easy walk to town and the beach.